CaixaBank Pay allows you to make payments on contactless POS around the world using smartphones with NFC technology. These payments can also be done through stickers and contactless bracelets that the customer can request and manage through the app. We offer our clients different solutions so we can adapts to their needs.  Once the client downloads all of his cards in the app and selects the card he wants to use to make the payment, it generates the HCE duplicates (Host Card Emulation). 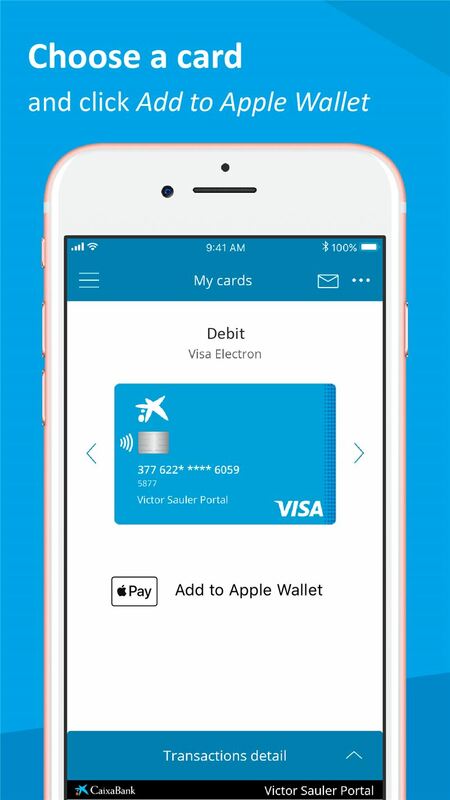 For Apple users we offer the possibility of enrolling his cards on Apple Pay. 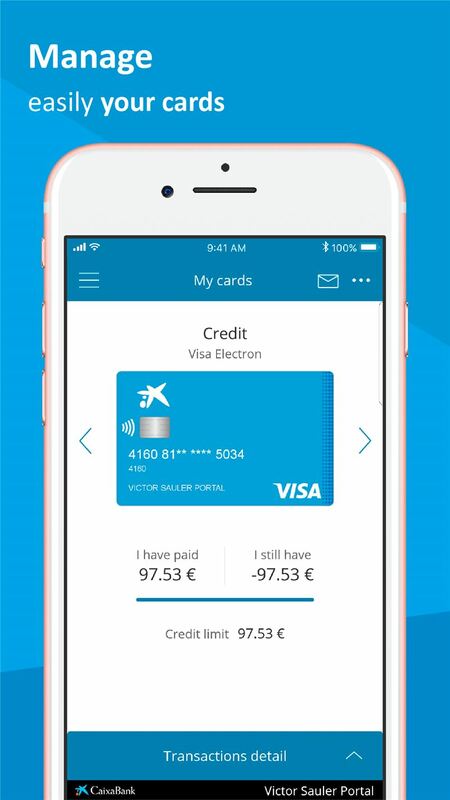 Our entity is the first one to allow the download of the Visa cards to make purchases from our own application. 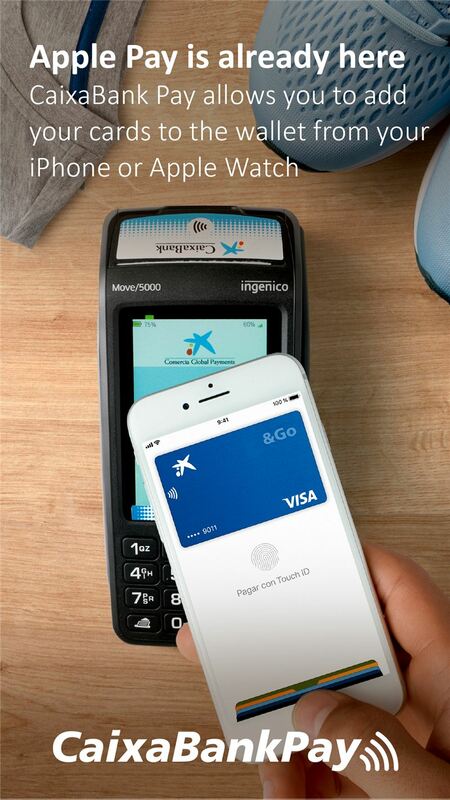 CaixaBank has begun to operate with the Apple Pay payment system, available for its Visa cards. The agreement is a milestone for the Spanish financial sector because CaixaBank «has the largest number of customers that operate with mobile phones» in our country. 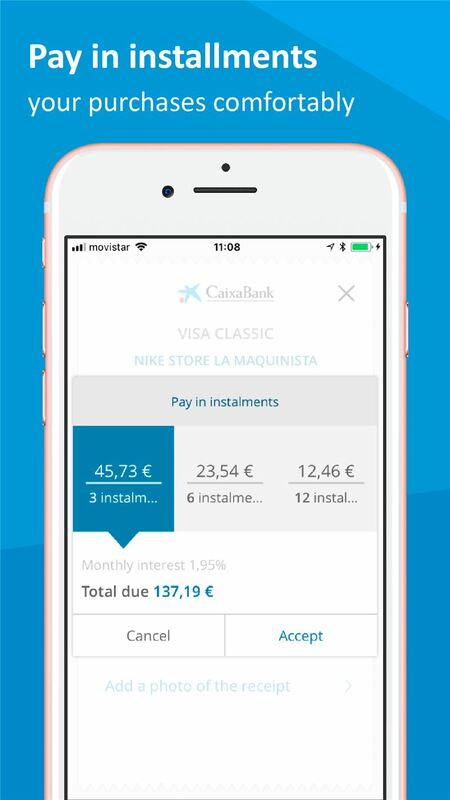 In addition, Apple Pay is integrated into the bank's own mobile payment application, so that, for the first time in Spain, customers can choose between downloading their card directly from the CaixaBank Pay application or from the Apple wallet, which it's like the users of other banks do. Thus, all of them will be able to synchronize this one with the Apple devices that they have, including Apple Watch and iPhone, and make the payments in all the stores without needing to carry the card on top. In addition, they can also perform, thanks to this same service, other types of procedures. It could be said that Apple Pay through our app puts on the user's mobile all existing banking services. - Manage cards: check operations, temporarily or permanently block a card, limit the use for certain operations, etc. - Pay purchases in affordable monthly payments and advance payments with credit. 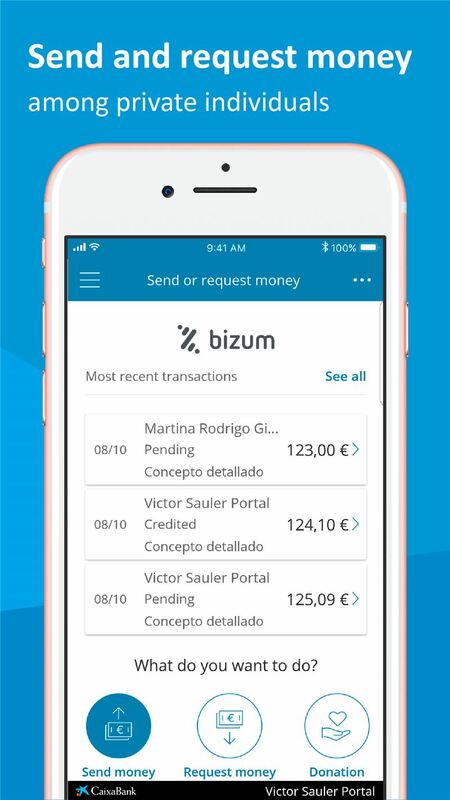 - P2P Payments: Send and receive money using Bizum instantly, even if the issuer and receiver are from different banks, only by knowing the recipient's phone number, without needing to know the IBAN. In addition CaixaBank has created a new service to send money between individuals through voice commands through Siri, the personal assistant for iPhones. This service is one of the first applications of biometrics to electronic payments in the European banking, turning CaixaBank into the first Spanish financial institution that offers a virtual payments activated with voice. The functionality is now available to all our customers in the new version of the CaixaBank Pay application. The iPhone voice assistant follows the user's instructions regarding the recipient, the amount and the concept and, finally, makes the payment. The user only has to touch the mobile to confirm the operation. The steps for the transaction are initiated when the user instructs the voice assistant of his iPhone to "send money". Automatically, the system selects the CaixaBank application. The customer has to say how much and to whom he wants to send it and Siri prepares the operation, ready to be confirmed through the usual security code, the only time the user has to touch the mobile. - Make purchases online with Masterpass. Masterpass is now available to all CaixaBank customers, being the first entity to adopt this service in our country. The service allows the user to make any payment quickly, comfortably and safely in all purchases through any device (PC, smartphone or tablet) and for any online transaction (by web or app). This innovative solution allows purchases online, without the client having to provide any personal data or their cards, or create new users and passwords, simply using the access credentials of their online banking or their fingerprint. 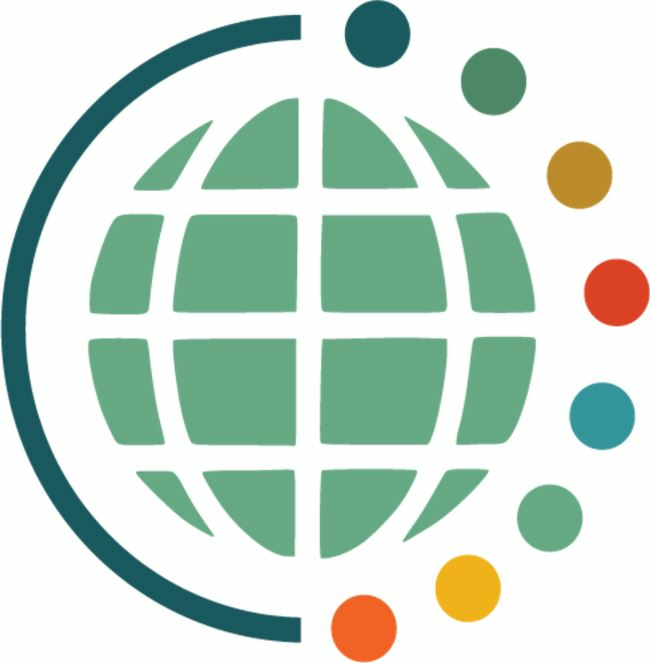 In another way: a virtual portfolio that brings together all the cards to be able to carry out fast and secure payments both in the physical and online environment. - Face ID. CaixaBank becomes the first bank in Spain to incorporate Apple's latest release - the Face ID identification technology of its new iPhone X - to its mobile applications. In this way, our customers can access their accounts by using facial recognition through their mobile terminal and without having to enter other access data, such as ID, user identification number or password. The service is available from the first day of sale of iPhone X. - Loyalty cards. Store all your loyalty cards on your phone. Collect loyalty points by scanning the barcode on your phone screen, or entering the barcode number. Find the right card, quickly and easily – no more fumbling through all your cards. Simple, secure and convenient. Financial innovation is the way to be able to redesign the need of the clients and repack them in a new and easy service. It’s crucial to stay updated in retail banking sector especially now with the new players facing in the payments. The center of the innovation has to be the client and his new habits to be on side of him. The need to pay was always a fundament in our life, the technology and the innovation are just giving a new reading key to interpret the easiness to perform it. In the next year we will face new challenges and tool we cannot image now, our effort has to be focused on get the sense of the innovation without losing the contact with the client. As a matter of fact innovation should be a facilitator for our clients and never a blocker. CaixaBank distinguishes as an innovator bank more on the way the technology is served in favor of usability and seamless experience. The mobile payment is not a marker of innovation more important is how the client perceives the innovation and how it can help to simplify their needs.